Masten’s Xaero vehicle during assembly late last year. Private entrepreneurial rocket firms are throttling up efforts to create a new breed of reusable hardware capable of hauling payloads to the edge of space and returning them softly to solid ground. The work is being backed by NASA's Flight Opportunities Program, an initiative that recently united the agency's Facilitated Access to the Space environment for Technology (FAST) program and its Commercial Reusable Suborbital Research (CRuSR) program. The Flight Opportunities Program is managed at NASA's Dryden Flight Research Center in Edwards, Calif.
An objective of this NASA agenda is to provide frequent flight opportunities for technology payloads to fly aboard suborbital reusable launch vehicles that are capable of flying to a variety of altitudes, upward to some 62 miles (100 kilometers) altitude. "Partnering with U.S. suborbital reusable launch vehicle providers for integration of technology payloads and launch services is an effective way to use the innovations of American industry while meeting the technology development needs of the nation's space program," explained NASA Chief Technologist Bobby Braun in a press statement. To date, most reusable suborbital vehicle vendors have yet to achieve flight to over 62 miles (100 kilometers), but they are targeting their craft to reach that altitude by the end of calendar year 2011. Meanwhile, payloads are being finalized to fly on developmental test flights of Masten Space System's Xaero vehicle, as well as Armadillo Aerospace's Super Mod platform. The Xaero rocket is a vertical-takeoff, vertical-landing vehicle being developed in part with NASA money awarded in August. Masten Space Systems conducted the first free flight of Xaero at the Mojave Air and Space Port in Mojave, Calif., June 29. Colin Ake, director of business development for Masten Space Systems, said that the June 29 test was not one of the two Xaero test flights being funded by NASA's commercial suborbital program. The first of those tests was to take place in December 2010, but that date has slipped. 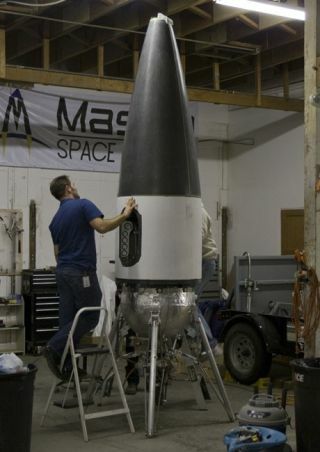 As of July 1, Masten had not set a new date for the launch, Ake told Space News, a SPACE.com partner publication. Meanwhile, Masten is readying its new suborbital vehicle to tote payloads, Ake said. According to the Masten website, for many years, large amounts of atmospheric data have been inferred from satellite measurements. Today, given the advent of reusable rockets that return to their launch pad and routinely fly through the upper atmosphere, a new research window is now open to atmospheric scientists and researchers. "On the first two flights, Masten will be flying two payloads selected by NASA," Ake said. "Our flights will take place from the Mojave Air and Space Port on our Xaero vehicle." The payloads to be flown are a Suborbital Flight Environment Monitor that measures several parameters of the flight, such as G-loads, vibration, temperature and pressure, which a future payload will have to be designed to survive. The sensor was built by NASA's Ames Research Center in Moffett Field, Calif. The second payload, the Automated Dependent Surveillance — Broadcast (ADS-B) transceiver, was provided by the Federal Aviation Administration. The ADS-B uses GPS to determine its location and broadcasts that information to special ground station receivers being installed around the country. While NASA's Flight Opportunities Program is based on the credo, "Fly early, fly often, fly safely," the shakeout of reusable suborbital vehicles has also embraced the axiom of "Crash, burn, and learn." Test shot of Dalek, under development by Armadillo Aerospace of Rockwall, Texas, lifting off from New Mexico’s Spaceport America. Such was the case for a June 11 test shot of Dalek, under development by Armadillo Aerospace of Rockwall, Texas. The open stretch of desert landscape offered by New Mexico's Spaceport America served as the setting for testing of SuperMod Dalek. Roaring skyward, Dalek reached a height of 4,796 feet (1,461 meters). But engine instability 11 seconds into the flight caused rocket fins to break off and other debris from the engine compartment to flutter to the ground. The recovery system on the rocket was deployed. The guided parafoil system is a novel one for Armadillo Aeropace. Dalek spiraled in under the parafoil and crunched into the desert, still loaded with propellant that fueled a small brush fire, quickly put out by a local fire crew. While things didn't go quite as expected, valuable lessons were learned, and Armadillo plans to return to New Mexico's Spaceport America for future flights of its vehicles. It's the intent of Spaceport America to provide a confidence-building environment, with latitude for learning from mishaps. "Space flight does involve rocket science among many other disciplines and it is hard work," said Christine Anderson, executive director of the New Mexico Spaceport Authority in Las Cruces. "Many people often view an aborted flight test or one that did not achieve all mission goals as a failure. Assuming there was due diligence behind the flight test and sound engineering practice, I do not view these flights as failures," Anderson told SPACE.com. Anderson added that so called "failures" can be very valuable lessons on the path to gaining more insight that will ultimately lead to achieving overall program success.